Now it's time to get creative! Here is a little selection of some of the bespoke designs I have done for my past couples. With my bespoke service, your wedding stationery is created to your brief and designed entirely from scratch. I have produced great designs for many happy couples and in each instance have loved getting to know the people behind the theme or vision for the wedding, as this is what lets my imagination really fly! Getting married is such fun, and I hope to bring some of that to you too, along with my creativity, expertise and passion for design! Like the designs, pricing is bespoke too, depending on the complexity of what you want and the printing costs involved. Our bespoke designs start at £100 plus production/printing costs, but please get in touch for a quote. I will work closely with you to ensure your wedding stationery is perfect for you, so please get in touch with me below and we can arrange a chat or a coffee to talk through your thoughts and ideas. I had the absolute pleasure of working with the lovely Fliss and Rich on their Christmas wedding invitations. They get married at the gorgeous East Quay Venue on 23rd December and opted for deep, wintery reds with gold leaf edging. Camilla and Chris wanted a simple and elegant design for their rural and rustic September wedding. I used modern calligraphy and some beautiful foliage to create this design for them. Kate and John's 1920's themed wedding required some beautiful, art deco, gold save-the-dates for their guests. With some little decorative touches, I think even Jay Gatsby himself would love these invitations! Nicole and David wanted a simple, clean and modern design for their winter wedding in Scotland. Teamed with a hint of gold and rustic brown envelopes, this design really captures the feel of their December barn wedding. Andy and Jodie wanted a boarding pass as their wedding invites, to tie in with their aviation themed wedding. 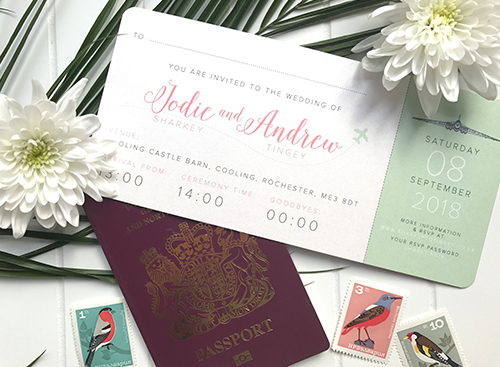 I teamed this with their mint green and baby pink wedding colours to create a super cute and different take on a wedding invitation. Vicky and Steven wanted their wedding stationery to fit with their modern, woodland wedding theme. With a beautiful colour palette of sage green, pink, baby blue and yellow - matched with clean, simple iconography - this design really showcased the couple's alternative style.